Minimum quantity for "Jet Zone" is 12. 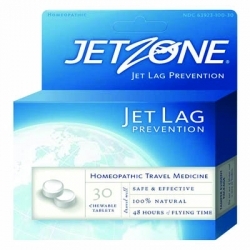 A homeopathic combination jet lag remedy for the temporary relief of the disruptions in circadian rhythms and fatigue associated with jet lag from flying and the symptoms of insomnia, exhaustion, irritability and anxiety. For Adults and Children over 6 years: Chew one tablet, one hour prior to every take off. Chew one tablet approximately every two hours during flight and one after landing. No need to wake up if you are asleep; get your rest and continue with taking the tablets approximately every two hours when you wake up.